Racial profiling is never a great way to start a visit, followed by disorientation in the dark. Thankfully it led to a peaceful riad with its natural rhythm of birds, butterflies and bees in the bougainvillea, the faint scent of orange blossoms on the rooftop, and a cheep-fest at 6:30 and 18:30. A stark contrast to the chaos and call to prayer in the Medina. Souks, spices and smokiness of the square — it’s all here. Cons: Having a staff of three people and no ‘me’ time or independence, being covered all the time, pollution/scooters in narrow alleys, bread and mint tea 24/7/365 though intentions are good on three of four. Pros: Souk tour, cooking lesson (wow! ), water, meeting J, sfenj, Jer’s visit, Meryam, Le Foundouk, rooftop tent. Shopping at Carrefour took 2-3 hours in Arabic. Much. Overwhelm. Must. Sit. Silent. In. Corner. French at a minimum is needed to avoid many lost-in-translation moments. No hammam. No camels. Next time I may stay in Gueliz. Now someone please give me a steak! Going north to Chefchaouen and Fez, where I understand it’s more European, and Spanish is spoken. Might have a fighting chance there. Travel started smoothly with my driver (yes, my driver) dropping me at the glittering Marrakech station with its easy-to-use machines. Then it began. Four horrible tourists in my carriage, train to Tangier was late, stopping in an unpronouncable town for 2 hours, causing me to miss bus to Chefchaouen, and where I could have been stranded if not for Ismail’s advice using my last phone credits. Unexpectedly continuing to Tangier, a city I originally planned to overnight-train to (hmmm! ), and another 2.5-hour delay, I had no negotiating power nor an ATM, so I kissed 75 euros goodbye for the scariest taxi ride ever and only tipped because I was thankful to be alive. Also cheated of a clear night and lost a choice bus to Fez. Once at Casa Perlata, life changed. I could speak Spanish, hearing more than a few Holas, enjoyed super sfenj and got lost for three hours in a slice of life where I was the only foreigner. 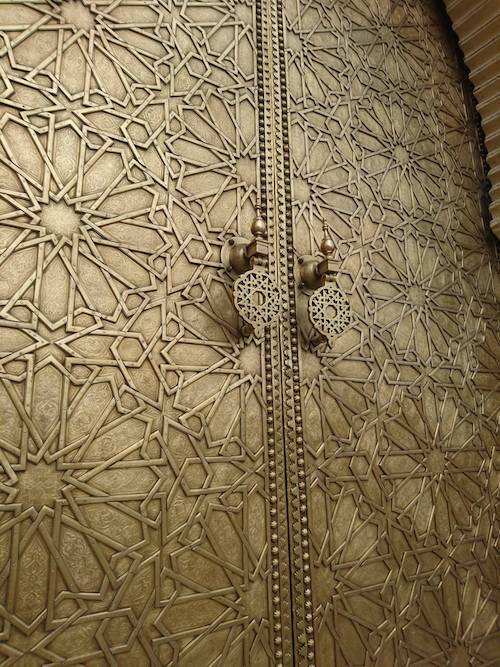 A night of rain was followed by a morning walkabout in a real-life Chagall painting of blues, minarets and mosques with gorgeous inlaid woodwork, and too many beautiful doors to count or photograph. My visit ends with ghriba bahla, the best sesame version I’ve ever tasted. An amazing time. Gracias! And meow, baby!